Jeb Bush might enlist George W. Bush on the campaign trail. 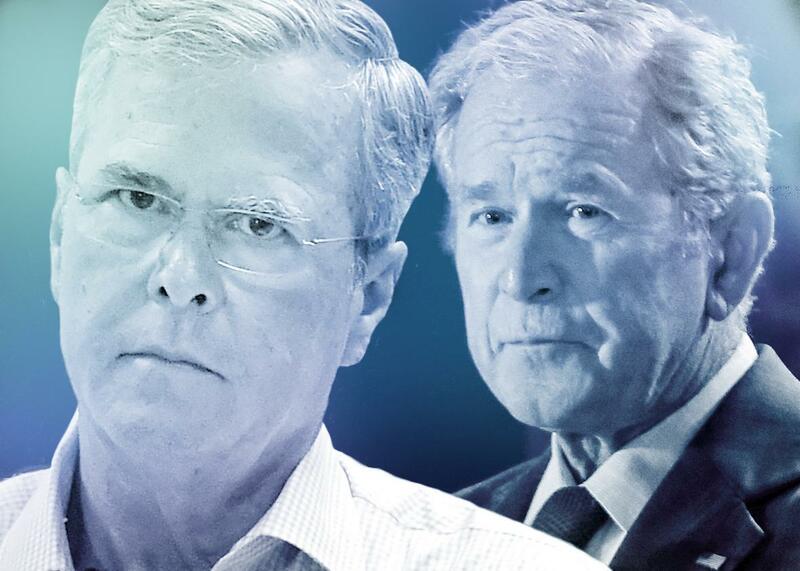 Could George W. Bush Save Jeb’s Listless Campaign? George W. Bush, right, might be called in to try to save his brother Jeb’s campaign. Photo illustration by Lisa Larson-Walker. Photo by David Becker/Reuters and Jonathan Bachman/Reuters. It was Jeb Bush’s last name that probably kept him from running for president in 2008 and 2012, when memory of his brother’s tumultuous time in office was still quite fresh. And it was Jeb Bush’s last name that seemed like enough of a liability as he entered the 2016 race that his posters and slogans refer to him simply as Jeb! But now, as the establishment favorite struggles mightily in the face of considerable anti-establishment headwinds, Jeb’s advisers are beginning to wonder if that same name might be what can save his listless campaign before it’s too late. The New York Times reports that Bush’s team “has begun exploring” the idea of trotting George W. Bush out on the campaign trail in South Carolina to give Jeb a “boost with skeptical conservatives” in a state where he may need to make a crucial stand early next year. The idea, according to the Times, originally came from Palmetto State party officials but has since gained significant traction at Jeb’s campaign HQ. “To the extent it makes sense on the campaign, we’re going to be happy to have his support, and I know President Bush is willing to help,” Tim Miller, Bush’s communications director, told the paper. Miller hinted that George could appear at South Carolina rallies for his brother in the lead-up to the state’s February primary, the third nominating contest on the 2016 political calendar and one that might prove particularly important for Jeb given his current also-ran status in the first two, Iowa and New Hampshire. While Bush has already enlisted his older brother to help solicit big-dollar donations from his family’s sprawling network of the conservative rich and richer, a public appearance from 43 would represent a major shift in strategy for a candidate who has for months tried to escape any and all talk of a political dynasty and avoid being tied to his brother’s presidency. Images of George and Jeb standing arm in arm onstage in Columbia or Charleston or Greenville would make that impossible. Using the former president as a high-profile surrogate would be a major gamble for Jeb. Democrats are already dreaming of the attack-ad fuel that such appearances would provide them for the general election if Jeb makes it that far. And, more immediately, Bush would risk further cementing himself as a political insider at a time when the outsider trio of Donald Trump, Ben Carson, and Carly Fiorina sit 1-2-3 in the national GOP polls. While those risks are indeed real, they might be overstated—or, more specifically, the Hail Mary might pose less of a risk to Jeb than sticking with a game plan that has taken him from the presumed GOP favorite to a political punching bag in a matter of months. What would he have to lose? Bush can’t lose the general election if he doesn’t win the primary first. And while liberals still have W.-PTSD, conservative voters tend to have fond memories of the last Bush administration. A New York Times/CBS News survey from this spring found that 71 percent of Republicans had a favorable view of George W. Bush compared with only 10 percent who said they had an opposite one. While there hasn’t been any state-specific public polling done on the issue, South Carolina is believed to be particularly Bush-friendly terrain. Using George would mean Jeb would need to abandon his I’m-my-own-man routine—but it’s not as though he’s been performing that to rave reviews on the campaign trail. Remember, Jeb’s first major campaign stumble came earlier this year when he struggled for days to find an answer to an Iraq War hypothetical that he and his team should have seen coming from 7,000 miles away. At last month’s CNN debate, meanwhile, Bush’s best received line of the night came when he defended his brother’s record on terrorism in the wake of Sept. 11, a talking point he made sure to repeat on social media and elsewhere in the days that followed. Jeb’s last name might not be on his campaign signs, but voters don’t need a Bush family Christmas card to remind them that he’s the brother and son of presidents. Given that, if he can’t right the ship soon, he might have no other choice but to stop trying to limit the political price of embracing his family name and start trying to maximize the rewards that come with it.